This GORGEOUS Outer Banks new construction home for sale is centrally located to EVERYTHING - shopping, fine dining, local attractions, and the wonderful multi-use path on Bay Drive...get your fitness on and truly enjoy your daily exercise while taking in the breathtaking views of the Albemarle Sound from Bay Drive. (You'll find yourself wanting to time your walks so you can drink in the simply stunning sunsets!) This beautiful home was built with easy living in mind...the low maintenance vinyl siding will save you both time and money over the years! 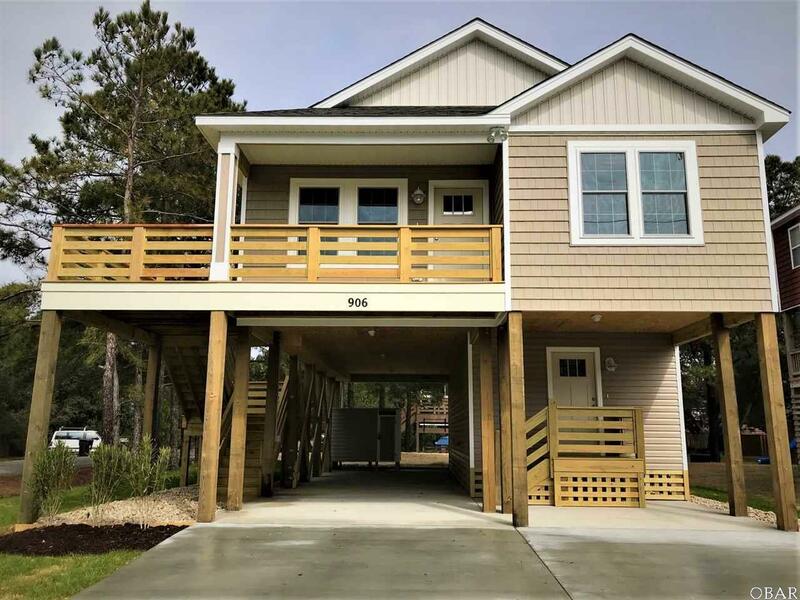 There's plenty of parking underneath, and a double concrete drive also...With 4 bedrooms and 3 full baths, there's plenty of room for the family. The 4th bedroom on the ground floor is HUGE, and could be a game room, an office, or a home theater room - the choice is yours... Upstairs, you'll find the open floor plan so inviting! The hand finished hardwood floors gleam; the spacious dining room has cathedral ceilings and is beautifully appointed with wainscoting; the upscale kitchen features tons of custom cabinets, stainless appliances, and quartz countertops complete the look. The bathrooms boast custom tile showers, and quartz countertops. The spacious master bedroom has his and her custom closets with wood shelving. No detail has been overlooked, and when you walk in, you'll FEEL the quality construction. Come see!